WHY WAIT ON NEW CONSTRUCTION? 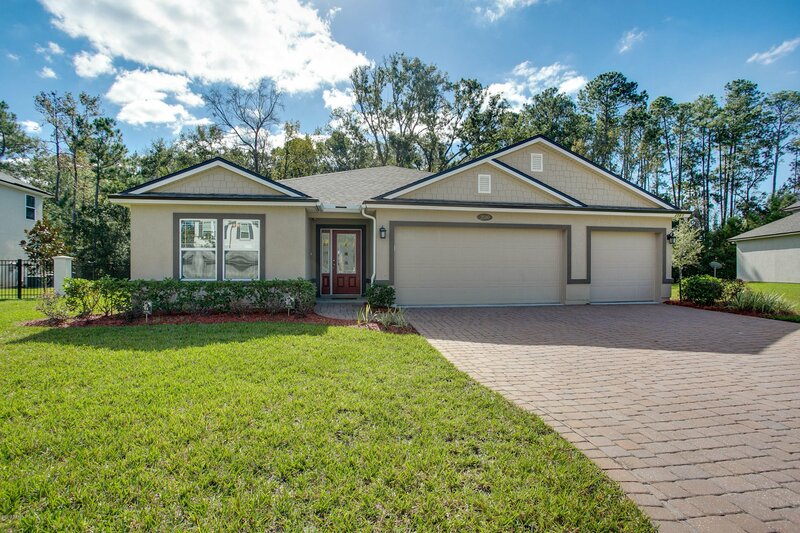 This like new 4br/3ba, 3 car garage home in the heart of Mandarin is waiting for new owners! $6500 Flooring Allowance with Acceptable Offer! Great curb appeal with pavered driveway and beautiful lead glass front door. Located in the quaint community of Three Oaks with just 31 homes! Popular ''Destin'' floor plan features living/dining area and fully equipped kitchen with 42'' cabinets, tile back splash, stainless appliances, Corian counters, walk-in pantry, breakfast bar, and spacious breakfast nook. 3-way split bedrooms. Owners suite features step ceiling, recessed lights and large walk-in closet. Master bath features dual vanities, shower & garden tub. Enjoy bbq's on the covered lanai overlooking the back yard that backs to beautiful preserve area. Spacious 3 car garage with pull down attic stairs. Great location, close to major shopping, I295 and I95. Mandarin is a peaceful place to call home! Listing courtesy of RE/MAX SPECIALISTS. Selling Office: KELLER WILLIAMS REALTY ATLANTIC PARTNERS SOUTHSIDE.